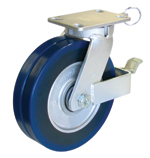 Swivel-EAZ® is a one-of-a-kind split outer tread wheel made of premium urethane. The technological design of Swivel-EAZ® wheels far exceeds the competition for reduced turning and rolling resistance on swivel, rigid and fixed axle systems. ﻿A one-of-a-kind split outer tread wheel, the Aubin Swivel-EAZ® is the ultimate solution for the many industries searching to satisfy all of the ergonomic requirements and standards within today’s environment. 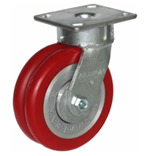 The technological design greatly reduces turning and rolling resistance on swivel, rigid and fixed axle systems. 3", 4", 5", 6", 8", 10", 12"
2-1/2", 3", 3-1/2", 4-1/2", 5-1/2"